Edited by Pascal Gielen. Text by Kenny Cupers, Bart De Baere, Ann Demeester, Jimmie Durham, Alex Farquharson, Mark Fisher, Pascal Gielen, Marc Jacobs, Sonja Lavaert, Thijs Lijster, Isabell Lorey, Markus Miessen, Chantal Mouffe, Gerald Raunig, Patricia Reed, Nicolaus Schafhausen, Blake Stimson. Today’s networked society offers us many possibilities for transmitting information, for interactive communication, mobility and flexibility. It also has a latent side effect: it renders the world ‘flat.’ Time-honored hierarchies, traditions, elites and canons are subject to the challenge of eroding movements. In such a flattened, horizontal world, art institutions are finding it hard to survive. After all, institutions traditionally represent verticality: historic profundity, tradition, dignity and certainty. 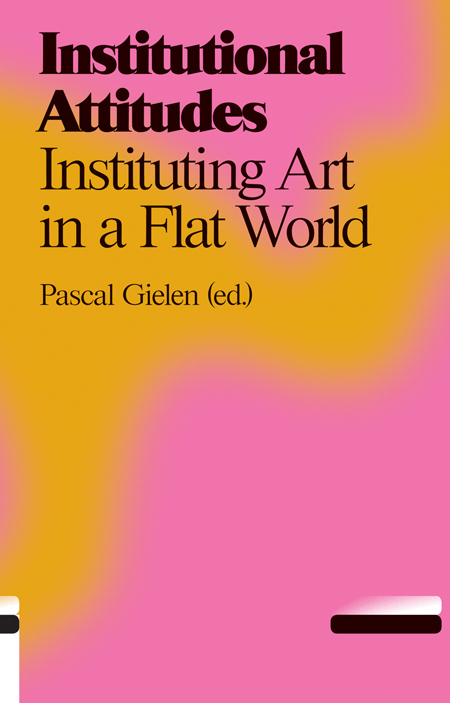 In Institutional Attitudes, Kenny Cupers, Bart De Baere, Ann Demeester, Jimmie Durham, Alex Farquharson, Mark Fisher, Pascal Gielen, Marc Jacobs, Sonja Lavaert, Thijs Lijster, Isabell Lorey, Markus Miessen, Chantal Mouffe, Gerald Raunig, Patricia Reed, Nicolaus Schafhausen and Blake Stimson explore the future identity of art institutions. Will they be able to reinvent historical profundity? Is this desirable? And if so, what would these new vertical institutions look like?